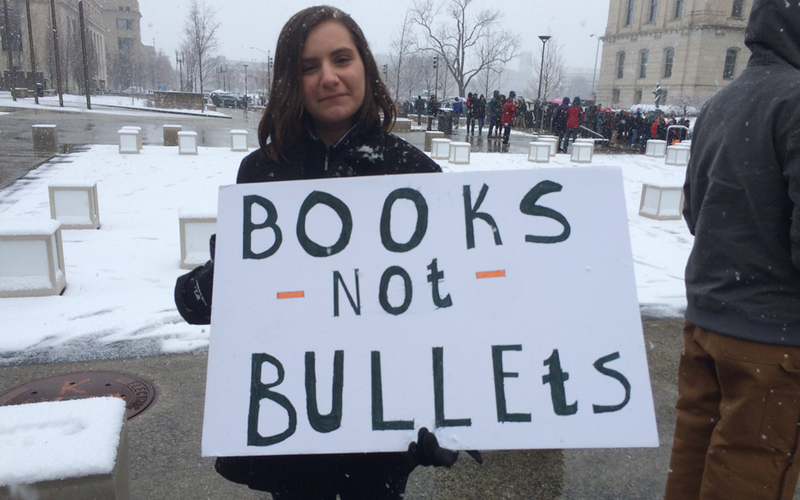 INDIANAPOLIS—Students, teachers, parents, and their allies converged in the cold and snow at the Indiana Statehouse Saturday to rally for gun control and school safety measures in the wake of last month’s shooting at Marjory Stoneman Douglas High School in Parkland, Fla. 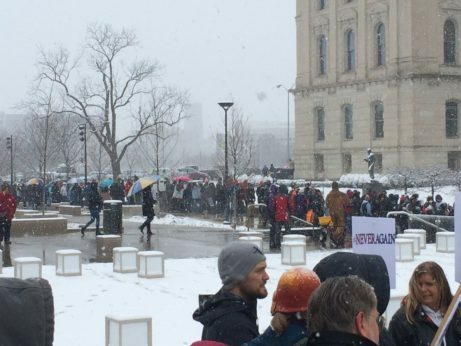 The line to get in wrapped around the State House grounds as hundreds waited patiently outside in a record-setting snow storm in March. The Indianapolis rally was held as part of the nationwide March for Our Lives demonstration. Hundreds of thousands of people from across the country participated in events, with the main Washington, D.C. rally organized by students from Parkland, where a gunman, 19-year-old Nikolas Cruz, killed 17 people and injured many others on Valentine’s Day with an AR-15 rifle he purchased legally. Bedford is a rural town in south central Indiana that has been hit hard by the opioid epidemic voted overwhelmingly for Trump. Still, Minshall is hopeful. She wanted to send a message to the legislators at the State House and in Washington: “This needs to stop. We need to make it harder for people to get guns.” Minshall reported that she has successfully organized over 30 students in her high school for the April 20 event. This is no small feat in rural Indiana and speaks volumes about the qualitative shift in political priorities in 2018. With marches and rallies taking place nationwide, the crowd in Indiana focused on holding elected officials accountable with a clear message for the elections in November. Their election warning comes at a crucial moment, as Republican Gov. Eric Holcomb is pursing a special legislative session in May to propose a school safety bill rumored to be aimed at arming teachers in Indiana schools. The special session will cost Hoosier taxpayers $30,000 per day. Mass shootings in the United States are unique among industrialized nations, but they are not without context. As the U.S. military and its intelligence agencies engage in violence across the globe, while defense contractors reap profits from the overproduction and sale of assault rifles to the military, and then the population, the connection between an economy based on war and the mass shootings of working people of all ages at nightclubs, concerts, jobsites, and students at schools should not be missed. These events at home and the wars abroad are a spin-off result of capitalism’s drive to maximize profits and then cynically justify it through promotion of the ideological images of rugged individualism and American exceptionalism—messages sent to citizens by organizations like the NRA. Now, students and workers around the country—under the slogan “Never Again”—are fighting back against the NRA, a right-wing organization that is, for all intents and purposes, an organized and armed political faction of the Republican Party representing the interests of gun manufacturers. The NRA’s individual membership consists of a white, male majority and carries with it, a white supremacist legacy. Elected representatives who vote to support profits over the lives of children and teachers are going to feel the consequences during the midterm elections as masses of mobilized people turn out to vote. Students “will no longer risk their lives waiting for someone else to take action to stop the epidemic of mass school shootings that has become all too familiar,” organizers of Saturday’s events said. 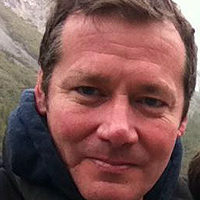 Jason Jones is a social worker writing about Indiana. One of his favorite quotes is “I'm a pessimist because of intelligence, but an optimist because of will." -Antonio Gramsci. Jones is a fan of the Hamilton Tiger-Cats and Beisbol Cubano.